Fel-Pro is the leading brand of replacement and performance automotive gaskets and sealing products. Check out the Recently Listed Air Cleaner Gaskets. Pit Stop USA is The Online High Performance Superstore! We feature Cylinder Head Gaskets - AMC at low everyday prices. Pit Stop USA is The Online High Performance Superstore! We feature Cylinder Head Gaskets - Buick V8 at low everyday prices. Pit Stop USA is The Online High Performance Superstore! We feature Cylinder Head Gaskets - Chevy Inline 6 at low everyday prices. Pit Stop USA is The Online High Performance Superstore! We feature Cylinder Head Gaskets - Chevy V6 at low everyday prices. Pit Stop USA is The Online High Performance Superstore! We feature Cylinder Head Gaskets - Chrysler 4 Cylinder at low everyday prices. Pit Stop USA is The Online Motorsports Superstore! We feature Cylinder Head Gaskets for Ford 2000/2300 at low everyday prices. Pit Stop USA is The Online High Performance Superstore! We feature Cylinder Head Gaskets for Ford 4 Cylinders at low everyday prices. Pit Stop USA is The Online High Performance Superstore! We feature Cylinder Head Gaskets - Ford 4.6L V8 at low everyday prices. Fel-Pro 326-455 Pontiac Exhaust Port Size 1.53" x 2"
Pit Stop USA is The Online Motorsports Superstore! Fel-Pro is the leading brand of replacement automotive sealing products. Fel-Pro offers a full line of performance head gaskets, gasket kits, head bolt sets and valve stem seals including Fel-Pro PermaTorque head gaskets, Fel-Pro PermaTorqueMLS head gaskets, Fel-Pro PermaTorque wire-ring head gaskets and Fel-Pro Loc Wire head gaskets. Fel-Pro Full Sets (FS) provide an engine overhaul in one set. Fel-Pro valve cover gaskets include Fel-Pro rigid-core molded-rubber valve cover gaskets, Fel-Pro composite performance valve cover gaskets, Fel-Pro Cork-Lam valve cover gaskets, Fel-Pro rubber-coated fiber performance valve cover gaskets, Fel-Pro Blue Stripe performance valve cover gaskets and Fel-Pro Fel-CoPrene synthetic rubber valve cover gaskets. Fel-Pro oil pan gaskets include Fel-Pro PermaDryPlus oil pan gaskets, Fel-Pro PermaDry oil pan gaskets, Fel-Pro performance oil pan gaskets, Fel-Pro rigid-core silicone rubber oil pan gaskets and Fel-Pro Enhanced Felcoid/Plus oil pan gaskets. Fel-Pro offers Fel-Pro intake manifold gaskets, Fel-Pro exhaust header gaskets and Fel-Pro exhaust manifold gaskets. The Fel-Pro manifold gasket line includes Fel-Pro PermaTorqueA intake gaskets, Fel-Pro PermaDryPlusA intake manifold gaskets, Fel-Pro performance intake manifold gaskets and Fel-Pro solid-core intake manifold gaskets. Fel-Pro R.A.C.E. sets include rear main bearing seals, timing cover gaskets and seals, and water pump gaskets and fuel-pump gaskets. 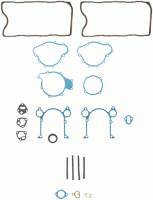 Choose Fel-Pro timing cover gaskets or Fel-Pro Sleeve aNa SealA timing cover gasket sets. Fel-Pro rear main seals include Fel-Pro PTFE Rubber Rear Main Seals, Fel-Pro Viton Rear Main Seals, Fel-Pro Nitrile Rear Main Seals and Fel-Pro Silicone Rear Main Seals. Fel-Pro offers Fel-Pro PermaDryPlus thermostat gaskets, Fel-Pro PermaDryPlus rigid carrier gaskets, Fel-Pro carburetor and air cleaner gaskets. We feature Fel-Pro Gaskets at low everyday prices.